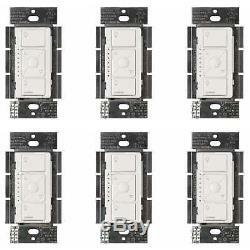 Lutron Caseta Wireless Smart Lighting Dimmer Switch (White) (6-Pack). Brand New in Original Packaging. 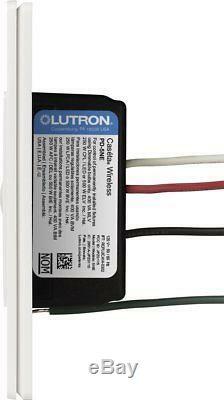 Lutron Caseta Wireless Smart Lighting Dimmer Switch for ELV+ Bulbs (White) x6. Lutron Caseta Wireless Smart Lighting Dimmer Switch for ELV+ Bulbs (White, 6-Pack). 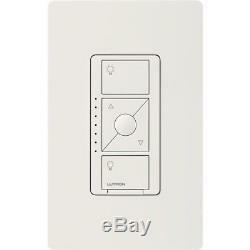 Lutron Caseta Wireless Smart Lighting Dimmer Switch for ELV+ Bulbs (White) (x6). Control your lights and shades from anywhere - whether you're home or away. Lutron Caseta Wireless Smart Lighting Dimmer Switch for ELV+ Bulbs installs in minutes and works with numerous bulb types - including dimmable LEDs and CFLs, and MLVs. It's extremely effortless to install the Smart Lighting Dimmer. In 3 steps you can replace an existing switch and install the Dimmer and it can take you as little as 15 minutes (neutral wire required), it is that easy to change your home into a smart home. The Smart Lighting Dimmer Switch allows you to control your lights through different ways. The Caseta Wireless Dimmer is compatible with ELV+ bulbs which controls many different types. Some examples are the 500-Watt of incandescent, halogen, or electronic low voltage, 400-watt of magnetic low voltage, and 250-Watt of dimmable LED or dimmable CFL (neutral wire connection and 10W minimum load required for all load types). The Smart Lighting Dimmer can control up to 29 bulbs per circuit (based on 8.5W LED bulb, 60W incandescent equivalent) and is tested and recommended for use with over 1,000 bulbs. The Caseta ELV+ dimmer is a great solution for LED fixtures with integrated, built-in drivers, ELV track lights, and problem LEDs that may prefer an ELV dimmer. The Caseta ELV+ Dimmer has a new preset button which allows you to recall your favorite light level so with one touch you can turn on the lighting of your choice. This user-friendly Smart Lighting Dimmer can be set to various lighting controls putting the lights in your home in the palm of your hand. The Smart Lighting Dimmer includes a Front Accessible Service Switch (FASST) for safe lamp replacement and the Dimmer works with Lutron Radio Powr Savr Occupancy and Vacancy Sensors in standalone applications (sensors do not work with Smart Bridge or Smart Bridge PRO). Ability to control lights anywhere through mobile device. Control lights with voice commands. Compatible with ELV and other types of bulbs. Can control up to 29 bulbs per circuit. Tested and recommended for use with over 1,000 bulbs. Includes a Front Accessible Service Switch. 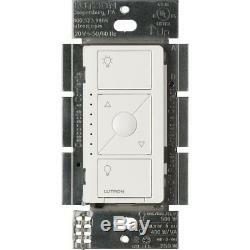 Lutron Caseta Wireless Smart Lighting Dimmer Switch for ELV+ Bulbs. In the Continental US Lower 48 states only. We cannot declare items at a lesser value or as gifts. F There are product categories which are not returnable due to hygienic or sanitary as required by manufacturers. In an event where there is an error regarding a price error or description, we will notify you ASAP. Items removed from their'blister-pack' display packaging are non-refundable. The item "Lutron Caseta Wireless Smart Lighting Dimmer Switch (White) (6-Pack)" is in sale since Tuesday, June 19, 2018. This item is in the category "Home & Garden\Home Improvement\Electrical & Solar\Switches & Outlets\Dimmers". The seller is "asavings" and is located in Brooklyn, New York. This item can be shipped to United States, Canada, United Kingdom, China, Mexico, Germany, Japan, France, Australia, Denmark, Romania, Slovakia, Bulgaria, Czech republic, Finland, Hungary, Latvia, Lithuania, Malta, Estonia, Greece, Portugal, Cyprus, Slovenia, Sweden, South Korea, Indonesia, Taiwan, South africa, Thailand, Belgium, Hong Kong, Ireland, Netherlands, Poland, Spain, Italy, Austria, Israel, New Zealand, Singapore, Switzerland, Norway, Saudi arabia, Ukraine, United arab emirates, Qatar, Kuwait, Bahrain, Croatia, Malaysia, Chile, Colombia, Costa rica, Panama, Trinidad and tobago, Guatemala, Honduras, Jamaica.